This immaculate and well maintained Mandolin Bay Villa is the perfect destination for an extended stay vacation. Conveniently located between Sanibel Island, Fort Myers Beach, and shopping. Perfect for couples or "snowbirds" looking to escape the cold winter! Rentals only for 3 month/90 day stays with special monthly rate. Now booking for 2020 from January 1 - March 31. Please message me before booking. We're flexible on dates and timing. Thanks so much. Enjoy the spacious living room and private screened in lanai with seating for two, perfect for enjoying a hot cup of tea or coffee in the morning. The master bedroom includes a Queen size bed, walk-in closet, and en-suite bathroom. The second bedroom has two single beds and a nearby full bathroom, perfect for guests or family members. After a day at the beach, play a game of cards with guests around the dining table in the cozy nook area beside the full-sized kitchen, equipped with everything you need for your stay. Go for a relaxing swim in the outdoor heated pool or the hot tub privately located by the Mandolin Bay Villas Clubhouse. Enjoy complimentary access to the pool table, fitness room, library and more located in the clubhouse. Full access to the entire villa. Complimentary access to the community clubhouse, including fitness center, pool, and hot tub. This is a gated community so we will share with you the electronic pass. Other things to note: The living room includes a pull-out couch with Queen size bed. You’ll be greeted by us, New York snowbirds turned Florida locals, Helen and George. We look forward to making sure your stay is as relaxing as possible. After check-in, we will only be in contact if you need us by phone. Living room couch has a pullout Queen size bed. There is a library in the Clubhouse. Enjoy seating for two in the screened lanai area. The club house has a hot tub, swimming pool, high speed internet, TV and DVD players, game room, fitness center with treadmills and Nautilus equipment. A first class winter getaway condo. This condo was way beyond our expectations. It is situated in a nice complex and in a great location to shopping, beaches and restaurants. We were there for 4 months and very comfortable. George & Helen are very gracious and accommodating owners. condo for the winter months and enjoy every day of being there. 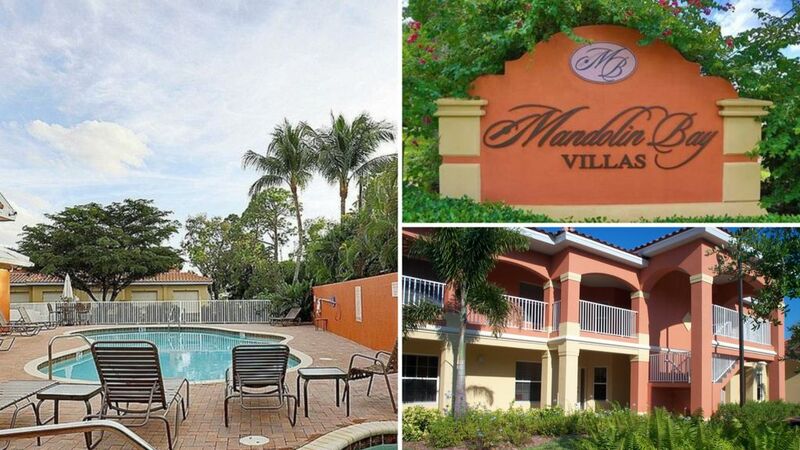 Mandolin Bay Villas are close to world-class shelling beaches, the area's finest healthcare facility and minutes from Sanibel Factory outlet shopping. Nearby are numerous golf courses, tennis, boating, fishing, restaurants and shopping.